When you buy a new car, you normally tend to look after and do all possible things to keep your car in a healthy state. Even a small scratch or an ugly mark on your car`s body is enough to give you sleepless nights. In addition, a minute negligence in servicing or a delay in replacing any damaged part of your car could result in lasting damages to your much-loved vehicle. In this situation, an assistant that can take care of varied requirements related to your car servicing and other aspects would be of great help. This is not an imagination anymore, as the Check&Drive 2.34 is there as a true- car caretaker for you. It is laced with the functions to track the car expenses and manage the records of fuel, repairs, trip log, etc. 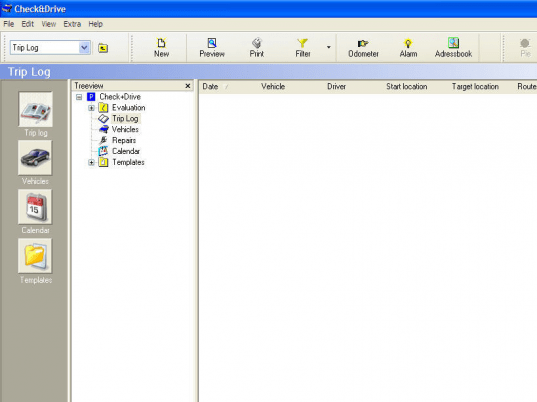 By using the Check&Drive 2.34, you can easily view and keep records of you car related events. To start keeping your car records, the program provides different tools like trip log, vehicles, templates, calendar, graphs, etc. The application’s main screen is divided in three parts; from left, the first pane shows four options, second pane displays the features presented in tree-view, and the third part presents the selected option’s sub features, graphs, reports, etc. Using ‘Vehicles’ option first you can keep record ofyou’re your cars and add their relevant details like financing, insurance, tax, fuel spaces, etc. Now you can start keeping the record using Maintenance, Maintenance History, Scheduled Events, Fuel Log, Images, General Expense and Incidents features. It’s easy for you to trace the Repairs, servicing appointments, and other events, and the program is also capable of generating graphs and reports collecting the details. The Templates feature includes commonly carried out things or tasks relating to your car that you can keep the record of. The Check&Drive 2.34 also boasts host of features like preview current list, print the report or graph, odometer, maintenance object alarms, address book and even more. In consideration to the extensive feature-set and its stellar performance the program is assigned with 4 rating points.